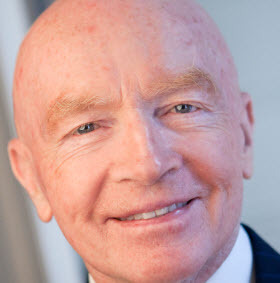 David Holder: Mark Mobius, executive chairman of Templeton Emerging Markets Group (TEMG), has announced his retirement after more than 30 years with the firm, effective 31 January 2018. Mobius joined Franklin Templeton in 1987, and is one of the most well-recognized emerging market investors. Given his longstanding tenure, Franklin Templeton has been planning for Mobius’ retirement over the past few years, notably appointing Stephen Dover to replace him as CIO of TEMG’s in April 2016. In 2017, Mobius’ name was officially removed from TEMG strategies and in reality he has not been involved in the day-to-day management of funds for quite some time, instead he has focused on being a key spokesperson for the group. UK investors will probably be most familiar with Mobius via his management of Templeton Emerging Markets Investment Trust (TEM) from June 1989 to October 2015 at which time he was replaced by the highly regarded Carlos von Hardenberg as lead manager. We believe TEMG is on the right track under the leadership of Dover. We have seen some positive changes since his appointment including an increased focus on risk management, improving the consistency across various vehicles run under the same strategy and reinvigorating the substantial global analyst resource. Overall, we think that Mobius’ retirement has been well-planned, and investors should not be too concerned about his departure. There are no implications to the Morningstar Analyst Ratings of the TEMG offerings under our coverage.